When assessing a house, most homeowners focus on what’s visible to the naked eye. They look at obvious signs of wear and tear as well as aesthetic components. What they often miss are structural defects that could require foundation repair. Whether you are looking to buy a house or considering a house renovation, you need to be concerned about the structure’s foundation. Spotting defects early on will allow you to take steps to address possible serious risks to you and your family. Ill-fitting doors and windows – wood and other building materials react to extreme temperatures by contracting and expanding. It is easy enough for homeowners to think that this could be the reason why the doors and windows are not fitting as perfectly as they did when they were put up. When you observe that your doors and windows do not quite fit against their frames, it’s best to call and have your house inspected by a foundation repair professional. 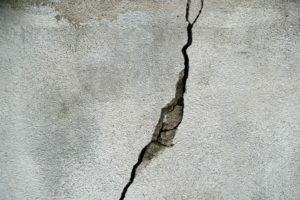 Cracks on the walls – tiny cracks could be signs that your foundation is settling and your house could be in danger of crumbling (maybe not immediately, but sometime in the near future). It goes without saying that this puts your family in danger of injury or even death. You might also observe your wall paper creasing, wrinkling, or tearing because of the shifting in the walls. Gaps in joined areas like moldings and caulking – these are obvious signs of settling and shifting in your house’s foundation. The ground could be sinking too, resulting in structural damage to the foundation. Check the area near your foundation to see if the floors are starting to sink or slope. When you do not pay attention to the signs of foundation trouble, you could be putting your family at serious risk. The worst case scenario would be your roof and walls crumbling down on you and burying everything in your house. If you do catch the problem before this happens, you might need to spend more money on repairs and restoration. It is best for you to detect any foundation repair problems early on to save you from the hassles, costs, and dangers of home structural defects. The signs are not difficult to spot especially if you have your house inspected by a professional. In Sugar Land, Texas, there are professionals you can rely on for reliable foundation repair. All you need to do is to call for an inspection appointment to get the process started. You will get an accurate assessment of the structural integrity of your house. These professionals will also make recommendations on what repairs need to be done to restore your house and make it structurally sound again.